Welcome to VET Report Vitals, a column focused on the results of the groundbreaking Banfield Veterinary Emerging Topics (VET) Report, “Are We Doing Our Part to Prevent Superbugs? 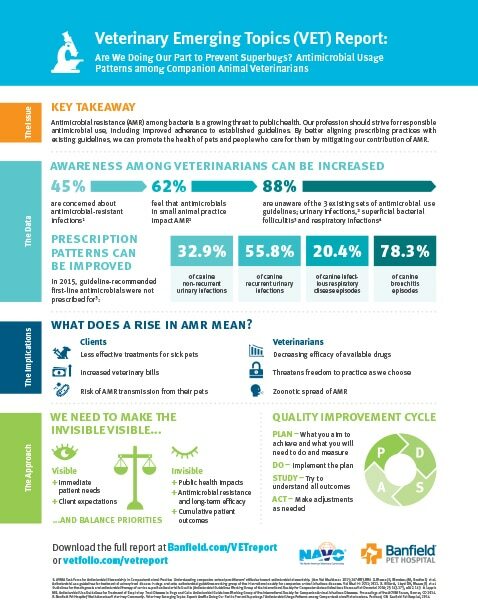 Antimicrobial Usage Patterns Among Companion Animal Veterinarians.” This report, a collaboration between the NAVC and Banfield Pet Hospital, focuses on a critical topic: antimicrobial resistance. VET Report Vitals will present data from the report and put it in practical context. The first annual Banfield Veterinary Emerging Topics (VET) Report was released earlier this year. Titled “Are We Doing Our Part to Prevent Superbugs? Antimicrobial Usage Patterns Among Companion Animal Veterinarians,” it emphasizes how antimicrobials can be critical for patient quality of life and survival. Its purpose, however, is to promote prudent antimicrobial use among companion animal practitioners by providing a baseline of antimicrobial usage data that may contribute to the discussion on how to achieve better concordance with published guidelines (Box 1). The report includes Banfield Pet Hospital data from 926 general practice hospitals in 43 states, with approximately 135,000 dog visits each week and a provider base of 3,850 veterinarians. Urinary tract infection (UTI) and respiratory tract infection (RTI) data from canine patients were extracted and evaluated. Low awareness of and adherence to guidelines. Although guidelines have been developed to direct treatment of common companion animal infections, low awareness of these guidelines among veterinarians suggests poor concordance of usage patterns with guideline recommendations. The data show that 67.1% of nonrecurrent urinary infections and 44.2% of recurrent urinary infections received a guideline-concordant antimicrobial. The data also show that 79.6% of canine infectious respiratory disease episodes and 21.7% of bronchitis episodes were treated with a guideline-concordant antimicrobial. Antimicrobial use in UTIs. The VET Report shows that in 2015, 32,226 episodes of canine UTI were diagnosed, of which 95.2% were determined to be nonrecurrent in nature. The remainder of these episodes (4.8%) were preceded by 2 or more UTIs in the previous year. A urine culture and susceptibility (C&S) test was ordered for 6.2% of nonrecurrent and 24.6% of recurrent episodes. The report continues with a breakdown of data showing the frequency of in-hospital antimicrobial use for canine UTIs, in which a single antimicrobial was dispensed, by infection recurrence and C&S order status. It also shares the first-line antimicrobial options recommended by the International Society for Companion Animal Infectious Diseases (ISCAID) for canine UTIs. “We are proud to team up with the NAVC on the 2017 VET Report to raise awareness about the critical topic of antimicrobial resistance in companion animal practice and how veterinarians can address it in their own practices,” said Dr. Karen Faunt, Vice President of Medical Quality Advancement at Banfield Pet Hospital. The full report is available at Banfield.com/VETReport or VetFolio.com/VETReport. Antimicrobial use in RTIs. In 2015, of 27,046 episodes of canine bacterial RTI in which antimicrobials were dispensed, 95.1% were classified as canine infectious respiratory disease complex (CIRD) and 4.9% as canine bacterial bronchitis. The report continues with a breakdown of the data showing the frequency of in-hospital antimicrobial use for canine bacterial RTIs, in which a single antimicrobial was dispensed, by diagnosis. It also shares the ISCAID-recommended first-line antimicrobial options for canine bacterial RTIs. The report includes detailed data on usage patterns, as well as a discussion of guideline concordance opportunities. Ending with a solutions-based approach, it guides readers through the science of quality improvement and a model that any veterinary professional can use to create behavior change in their own practice to improve medical quality. A visual summary of the report’s highlights can be found below. BOX 1. What Are the Guidelines? American Association of Feline Practitioners/American Animal Hospital Association. Basic guidelines of judicious therapeutic use of antimicrobials. Available at: avma.org/KB/Policies/Pages/AAFP-AAHA-Basic-Guidelines-of-Judicious-Therapeutic-Use-of-Antimicrobials.aspx. American Veterinary Medical Association. Do’s and don’ts: antimicrobial therapy. Available at: avma.org/KB/Resources/Documents/AntibioticDoDonts_DOGpdf.pdf. American Veterinary Medical Association. Judicious therapeutic use of antimicrobials. Available at: avma.org/KB/Policies/Pages/Judicious-Therapeutic-Use-of-Antimicrobials.aspx. Hillier A, Lloyd DH, Weese JS, et al. Guidelines for the diagnosis and antimicrobial therapy of canine superficial bacterial folliculitis (Antimicrobial Guidelines Working Group of the International Society for Companion Animal Infectious Diseases). Vet Dermatol 2014;25:163-175, e142-e163. Weese JS, Giguère S, Guardabassi L, et al. ACVIM consensus statement on therapeutic antimicrobial use in animals and antimicrobial resistance. J Vet Intern Med 2015;29:487-498.